Antioxidants can help to reduce oxidative stress in our bodies, helping to preserve cell integrity and overall health. Without a diet rich in antioxidants, we are more prone to the common chronic diseases that plague modern society. Antioxidants are molecules that help to prevent damaging oxidation that occurs in our bodies as a result of reactive molecules called free radicals, produced in excess by pollution, radiation, fried/burnt foods, sunlight and some cellular metabolism. Damaging oxidation is called oxidative stress and is associated with illness, premature ageing and general biological stress. Supplementing the diet with a high-quality, wide-spectrum antioxidant is considered to be one of the most important things that we can nutritionally take to maintain optimum health. In fact, Patrick Holford says in his book The Optimum Nutrition Bible that, "Since the 1980s more and more research has confirmed that many of the twentieth century's most common diseases are associated with a shortage of antioxidant nutrients, and helped by their supplementation." AlphaCurcumin® Plus is a highly bioavailable curcumin phytosome complex with added Bromelain, Quercetin and Bioperine for comprehensive cellular support. Turmeric is ground from the root of the Curcuma longa L. plant (see picture below), a member of the ginger family which grows wild in the Himalayas and across South Asia. This yellow/orange spice plays a central role in ethnic cuisine in those areas, giving the traditional dishes of these regions their characteristic yellow colour. This spice has been a component of Ayurvedic medicinal systems of India, China, Tibet and the Middle East for over 2000 years. Curcumin is the primary curcuminoid class found in turmeric. 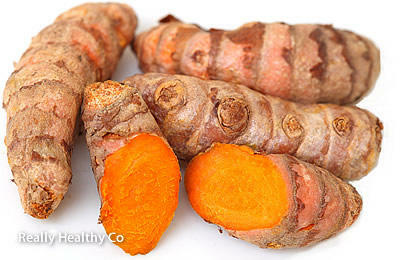 Only 2 to 5% of the turmeric contains curcumin which is the component, concentrated in the rhizome. It is the curcumin that is responsible for most of turmeric's health properties. Curcumin extracted from turmeric is a powerful antioxidant and anti-inflammatory, and overall it is regarded as one of nature's best protector nutrients and body cleansers, and is the subject of a great deal of scientific interest and research. The big problem with the beneficial compounds in curcumin is that they have very poor oral absorption. As a consequence, impractically large amounts are needed to derive the full benefits of curcumin. A solution to this problem has been found by finely mixing the curcumin with lipids, as curcumin is fat-soluble, and this vastly increases absorption by basically having the lipids carry the curcumin into the body. By finely mixing the curcumin either with curcuminoid oils or with a phospholipid medium to produce curcumin liposomes, the curcumin is surrounded by fats. This increases the absorption substantially, but the resulting mixture is not ideally stable and requires a large ratio of oil molecules to curcumin molecules to make it effective. A newly developed superior method to this lipid approach is to use a proprietary process to directly bond the curcumin molecules with phospholipid molecules in a 1:1 or 1:2 ratio. 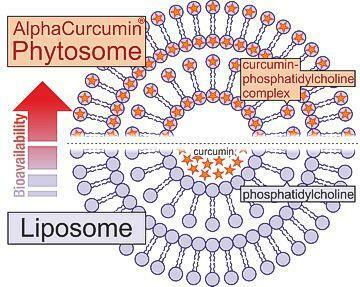 This produces a stable curcumin-phospholipid complex called a curcumin phytosome complex (curcumin-phosphatidylcholine complex), which is more effective and efficient than curcumin liposome complexes. The curcumin processed in this way has an absorption rate many times greater than that of ordinary curcumin complexes found in most food supplements, and this unleashes the full healing power of curcumin complex. The Really Healthy Company's AlphaCurcumin® Plus brings 250mg of this highly bioavailable curcumin phytosome complex (with sunflower derived phospholipids) together with 75mg of Bromelain, 50mg of Quercetin and 5mg of Bioperine (black pepper extract) in each vegetarian capsule, further enhancing the curcumin's already magnified beneficial effects. The result is one of the most potent curcumin supplements on the market today. AlphaCurcumin also contains no added binders, fillers or any other excipients — just the full power of undiluted, leading-edge, natural ingredients. Ingredients: Cucumin phytosome complex, Vegetable Cellulose (capsule), AlphaBlend, Bromelain and Quercetin. Directions: Take 2 to 4 capsules a day, preferably at mealtimes, or as directed by your health practitioner. AlphaGuard® Plus antioxidant complex is superior to most other full-spectrum antioxidant food supplements on the market. Burning calories is a natural process of oxidation that releases energy in our bodies. However, oxidation can be destructive when it is excessive and uncontrolled, which can happen with stress (physical and mental), poor diet, toxins and environmental pollutants, too much sun, radiation and illness. When this happens, our cells can become damaged by reactive molecules called free radicals and our energy and vitality deteriorates. Long-term, this can lead to premature ageing and degenerative conditions. Whilst the body produces some of its own antioxidants, the rest must be obtained through the diet, primarily from fruits and vegetables (especially their skins and pips). However, we live in a world where oxidative stress on our bodies is increasing due to rising pollution and stress loads, whilst dietary levels of antioxidants are decreasing, due to poor diets and the fact that our food is often grown in nutrient-depleted soils. The result can be compromised health. AlphaGuard® Plus is one of the very best all-in-one antioxidant supplements on the market today, combining many of the most effective antioxidant nutrients and complexes, including Vitamin C, Grape Seed Extract, Curcumin Extract, Quercetin, Bilberry Extract, Vitamin E, Alpha lipoic acid, Green tea extract, N-Acetyl cysteine, Zinc, Leutein, Beta-carotene, Lycopene, Zeaxanthin and Selenium. The reason we put such a potent variety of antioxidants into our supplement is that antioxidants work synergistically in the body — their combined benefit far exceeding the benefit we would obtain from taking them separately. And not only that, many of them have their own unique and essential function, so they must all be present for optimum well-being. This makes AlphaGuard® Plus the ideal food supplement for helping to prevent excessive oxidation in the body. Directions: Take one or two capsules a day with a meal, or as advised by your healthcare practitioner. Medpro Curcumin Combi Extra Forte is a highly bioavailable curcumin complex with added Resveratrol, a potent antioxidant. Curcumin is extracted from the root of the Curcuma longa L. plant and is also known as the yellow spice turmeric. This extract has remarkable health properties and has been a component of traditional medicinal systems in India, China, Tibet and the Middle East for over 2000 years. Curcumin is also a powerful antioxidant, and overall is regarded as one of nature's best overall protector nutrients and body cleansers, and is the subject of a great deal of scientific research. This brand of curcumin is highly absorbable making it many times more potent than other brands with a similar curcumin complex content. It also has added Resveratro which is another powerful antioxidant. Directions: Take up to 4 capsules a day, with meals, or as directed by your health practitioner. Premier CoQ10 from Premier Research Labs is a naturally fermented CoQ10 that contains the more effective trans isomeric form of this vital nutrient for advanced cariovascular, nerve, brain and immune support. Coenzyme Q-10 is a very powerful antioxidant that plays a vital role in some of the most important biological pathways in the body, including those involved with energy production. It also protects for cell membranes. (For more information on CoQ10, Wikipedia.) This coenzyme , which is also called ubiquinone, is converted in the body to ubiquinol, which is its active biological form. As we age, the ability of the body to convert CoQ10 to ubiquinol decreases. Premier Research Labs' Premier CoQ10 provides a natural fermentation-derived fat-soluble ubiquinone in the trans isomeric form, making it more effective than most other CoQ10 supplements on the market. The manufacture of Premier CoQ10 does not use polysorbate 80 (an emulsifier made from polyethoxylated sorbitan), undesirable flowing agents or other excipients. Premier Research Labs' Premier CoQ10 is suitable for vegans and contains no magnesium stearate. Directions: Take 1 capsule, 3 times daily or as directed by a health practitioner. Pro-Knox is a natural low-molecular weight antioxidant complex that has a strong redox potential and more free radical quenching activity and efficiency than Superoxide Dismutase (SOD) alone. Oxygen is vital to life, but a side-effect of oxygen metabolism can be cellular damage, which over time, can lead to deterioration of the body. Normally these side effects of oxygen metabolism, caused by very reactive intermediary molecules called free radicals, are neutralized by antioxidants -- substances that prevent reactive molecules burning or oxidising other molecules. Some of the antioxidants we need are naturally produced by our bodies, but the rest are sourced from our diets. This is why doctors and nutritionists recommend a diet rich in fresh vegetables and fruits as these can be good sources of antioxidants. However, chemicals in the environment, stress, poor diets and alcohol can create huge amounts of free radicals and also reduce the dietary antioxidant levels necessary to neutralize them, which can lead to dangerous levels of cellular oxidation. Pro-Knox is a unique, powerful and natural antioxidant complex formulated with low molecular weight plant extracts to ensure high bioavailability and acitivty once absorbed in the body. Plant extracts used are rich in vitamins A, C, E, beta-carotene, quercetin, riboflavin, polyphenols, tannin, flavonoids, glutathion, catalase and superoxide dismutase (SOD). The final compound of Pro-Knox is obtained through a low-heat process that utilizes far-infrared rays to extract the active, low-molecular weight antioxidants. Directions: Take 2 or 3 sachets a day with main meals, or as directed by a healthcare practitioner. This amount can be increased to 8 sachets in total a day for serious support. Bulk Discount: Buy 4+ of this product and the unit price will be reduced by 15%.